Note: this is in blog form but I made it sort so the first post is at the top. Which means it goes on from here. Carry on. If you want to just skip to the good stuff, I recommend checking out arenanet's flickr stream from PAX 2008 - here is a good picture to start on. Well. Here it is, my first blog. It's not a personal blog though, just a journal of my progress in a project. This post is just an introduction. I'm not quite sure when it really started, so I am just pretending this was posted on July first. Well. Some background. 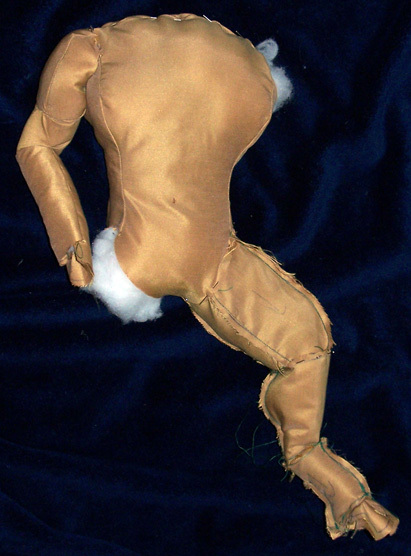 I've been making plushies for awhile now. Just every so often. Most of them have been Guild Wars related (but not all). More background. A friend called and asked if I wanted some scraps of fur she found while cleaning. Sure! I can always use more scraps. She drops off a huge bag, with ONE PIECE of fabric in it. This piece is about 2mx2m square. This is not a scrap. So of course, I have to do something with it. Thus, the megacharr is born. So we're making a large Charr. One thing you may not have noticed about Charr is a lot of them are different. There's different colours, different shapes, different stances... We need to pick one that works. The most restrictive thing here is of course the colour. I've got the fur already, and it's polyester so I can't bleach or dye it (don't think I didn't try). It obviously has to be a brown charr, but most of the ones I see are orangey and this fur doesn't have a bit of orange in it! Then, there it is. Another friend was helping me out, looking through the wiki for pics and found the perfect one - the Charr Mind Lord. Of course, he's a quest specific one. Gah. 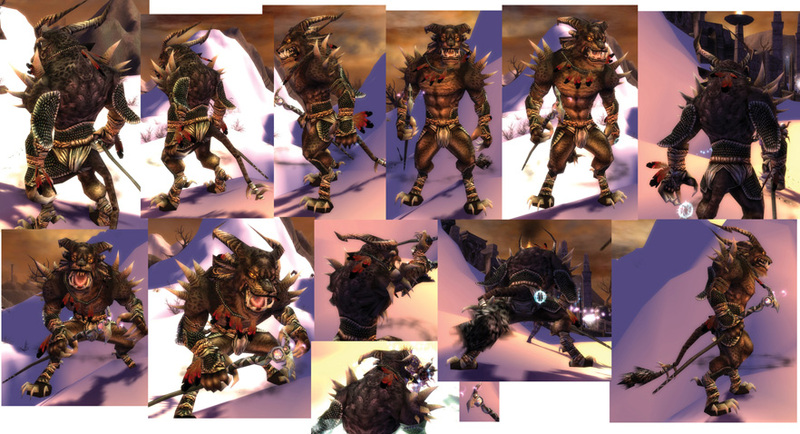 Then we realised that the Charr Chaot uses the same skin, just had a bad picture in the wiki. He's much easier to find. Yay! We have our Charr. Now that we have decided which type of Charr we're going to make, we need to get some reference shots. This mostly involves going ingame at the highest graphics settings you can get and taking screenshots. I had Jonathan help me for this step, he used pacifism and amity to keep the Charr still while I ran around taking pictures. I ended up with a bunch of decent shots, from which I selected the most useful and generated a composite image. I've attached a reduced version here. You'll note if you look closely that some of the background is unusually white, I went in with texmod ahead of time and blanked out a lot of the hill textures so that it would be easier to see the Charr. I also used texmod to pull the Charr's skin texture from the game, but it is remarkably low res and rather confusing, with Charr bits all over the place. So I'm likely to end up only using it for a color reference. This is a huge project. To inspire me to finish, and to get something started, I decided to do a bit of work on the embellishments. This guy's clothing is pretty simple. He's got some underwear, which is fabric and braided rope, and a bunch of wraps, which are fabric, braided rope, and... armadillo skin. I learned the identity of this material at PAX last year from Katy Hargrove. So: the challenge. How do I get armadillo skin? I certainly wasn't going to use the real thing. Even then, the pieces the Charr use come in... interesting shapes, bordered by a texture that looks like the armadillo's rings. I suppose I could have started breeding armadillos for their skin shapes, but I don't really have that kind of time. Something else, then. Fabric? Hard to find the right pattern, still border issues. Not very textured. As always, if I want it done right, I'm gonna have to do it myself. Let's skip the time I spent researching mold making and making it out of silicone. It was a neat idea but not really viable unless you are already into is (or know someone who is) so you're familiar with the materials and already have a supply of them. Even then, this is a bunch of one-off pieces. I needed a material that was flexible, easily molded, and paintable. I've used this Crayola Model Magic stuff before, and had some small chunks that I never got around to using, so I decided to try it and see if it would fit the bill. Note: this stuff is doomed as soon as you open the package. I had bought a six pack of half ounce packages that I bought on sale once, and decided to sacrifice one to use as a test. I picked the yellow pack, and while I was at it I ripped off a piece, rolled it into a snake, split it in three and made his earrings. May as well, rather than wasting a whole new pack on them later. I hadn't been able to find earrings of the right size in my shoppings. The rest of the material went between two pieces of plastic wrap. I rolled it out flat, then stamped circles into it using the end of a lip gloss container. I made the border lines with a wooden skewer. The plastic wrap was left on during this so that my stamping would make round bumps rather than just cutting into the material. Removed the plastic, let it dry. Tomorrow we'll see how it turned out. First, let's check on the 'skin'. Yay it is perfect! A little fragile, but flexible enough. Painting with acrylic paint and then wiping the top with a damp sponge seems to do a decent job of keeping the paint in the deep parts. I only had white acrylic, and the base was yellow, so obviously the colours are wrong, but the concept is sound. Next, the earrings need to be made gold. I have some 'antique gold' enamel paint and some gold bronzing powder from my model painting days. I've forgotten how to use the bronzing powder so the enamel will have to do. A few hours later I finally get the tiny jar open. A couple coats and a day later, the antique gold ended up a little too antique for my tastes, rather more green than yellow. So, onto the bronzing powder. Pushed it on with a q-tip, go to buff it in with a tissue. It comes right off. Great. The internets say you can laquer over it with a laquer made of egg whites, but that sounds flakey. You can mix it with clear enamel, but I don't have clear enamel. OK, I mixed it with the antique gold enamel. That worked decently well. I now have a set of gold Charr earrings! Feathers! He's got feathers as decoration all over. And not just plain single colour feathers, no, that would be too easy. These feathers start tan, turn vibrant red, and then have black tips. Black! Man, they don't make black kool-aid. That's right, kool-aid. I went out with my sister today, and she had some time before I got off work which she spent going to the dollar store and picking me up a pack of feathers (I had mentioned I was going to so she surprised me with them). Then on the way home we stopped in at Safeway and picked up 6 packets of kool-aid for $2. I had, of course, researched dying feathers earlier and found that to dye natural fibers like feathers and wool you need to use acid dyes. Kool-aid, the stuff you get in a tiny packet and are supposed to add sugar to, acts as an acid dye. it is cheap and vibrant. Kids use it to dye their hair when they can't get real hair colourings. I found a set of instructions online, first wash the feathers in a water/detergent bath to get the oils off, and then add some vinegar in with the kool-aid and water to help it set. There was another bowl too I forget what it was for. I read some sites saying the vinegar was unnecessary because the kool-aid has enough acid on its own, but it didn't hurt to add it. I'm not sure that there were any oils to wash out of my store bought feathers, either. They go in the microwave for a couple minutes in the kool-aid mix. I used orange and a bit of green to get the tan, and just did the whole feather in it for a very short time. They came out a little peach, I should have used more green. Then I put the blue and purple and the rest of the green in with the orange, stuck the feathers on the side of the bowl so just their tips were in, and stuck that in the microwave. They ended up a very dark burgundy. I tried to put them in longer but I guess they were saturated, they wouldn't get black from this. I then dumped that and made a new batch using two reds. Water tension wasn't enough to hold them 2/3 of the way in so I taped their ends to the bowl to hold them up. The red turned out well. The 'black' got even lighter when they dried the whole way, I ended up using a sharpie (permanent marker) on the tips to make them blacker. Sharpies don't work well on feathers, don't try to use them on the fluffy parts at all they will make the fluff stick together. They worked ok on the tips, because they were flat and already fairly dark so the gaps didn't show up so much. I might try to redo these later, I did a recount and found out I am actually one short. Kool-aid is cheap and I have lots of leftover feathers. This had nothing to do with the project. I came home from work to find my doggie crying and lying on her side. She stopped crying when I got to her, but she couldn't get up and was shaking. My sister came and we took her to the emergency vet, but they didn't know quite what it was, all of the options involved a ton of procedures and had low chance of success. It was a very difficult choice, I had to let go of my best friend of fifteen years. I'm going to take a bit of a break. Jonathan was up keeping me company this past week, and I got a bit of idea work going with the patterns, but they are the most complicated part of this project so they're not nearly done yet. We're going down to his place (he lives in Washington) for the weekend, I've taken Monday and Tuesday off (Tuesday is my birthday). While we're there I plan to do some shopping for project supplies. I'll get back to work on Wednesday. So, I'm back from my trip. I'd been writing notes and taking pictures all along but I've realised I'll likely never get around to writing this all up unless I do it as I go along. So I've downloaded this simple blog script and will use it to document my progress. I'm also going back in time and posting entries for what I did previously, so the dates and times on the entries before this one might be a little wonky. While I was in the states I went to Joann Fabrics, which is more of a craft shop than a fabric shop, and less premade than Michael's. I tried Michael's before but they were useless. Also most of this stuff was cheaper at Joann, esp. in the states. So, I've spent a big pile of monies and got most of the supplies I'll need for the project. Still missing a few but this should be good for now. This is probably the most complicated pattern of them all. Not only is it the main base, it has three joints going off at weird angles. It is *not* simple to visualise. Look at the arm, it's mostly 2D. There's a shoulder, there's an elbow. They bend on the same plane. Not so with the leg. First it comes off the torso at an odd angle (I've designed it so it can join the torso at a 45 degree angle, to make the connection simpler, but that meant a funny cut on my 'cylinder'). Then, it bends at the knee at a different angle. Then it bends again at the ankle, and goes into the foot. The ankle bend is about the same as an elbow, so it should be fine. The foot will require hand stitching of the little toes to get the claws in there too. I can do most of that on the bus to save time. A note: I'm not really explaining how I go about making the patterns. I realise people might want to know this (it is my most commonly asked question with the others I've made). Here's what I do. I take my screenshots, I stare at them. For a long time. I cut them up in my head. Then, I draw a pattern. Tweak the shapes a bit to make all the parts fit together, and then it works. Yeah. Didn't think that would help much. This is an organic process, not something I can reduce to easily followed steps. Since this is such a large project and I want to conserve fabric (in order to make it as large as possible), I've been making the patterns in Illustrator. This way I can make them, tweak them, and print them at whatever size I like. I've been printing them small and making sample pieces out of cheap fabric to make sure the patterns work. Then when I've got them all, I'll be able to place them all on a rectangle with the same proportions as my fabric and stretch them to fit the available space. Only then will I know how big the megacharr will really end up. This is also why I'm in such a rush to make the patterns. I can't do anything else until I know how big everything needs to be, and I won't know that until I've got them all. OK. Crazy long post... over! Next I think I'll work on the arms. This is confusing. The blog software works on server time, which is ahead of my time. I told it to use PST, so it changes the time when it puts the posts up, but it means when I put a post up late at night it has it in its database as being on the next day. Which is why thursday's post shows up on the calendar on Friday but when you click it it says Thursday. Confusing. Ah well. So long as they're all in order. Remember yesterday when I said the arm pattern would be easy? Apparently I was LYING. Not on purpose, mind you. He's got this giant lump of muscle on his shoulder that was difficult to wrap my head around. Anyways, I think I've got a base pattern now. Tomorrow I'll print it and make a sample out of my sample fabric and see how it turns out. 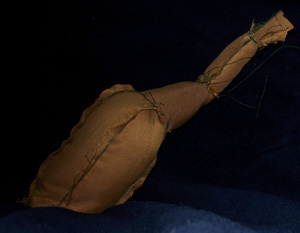 The fingers, like the toes (I forget if I mentioned this with the toes) will all have to be hand-stitched. Pesky giant claws would make the hand near impossible to turn it inside-out otherwise. At least with the fingers I can hide the seams under the hand wrap. Printed. Cut. Traced. Cut. Sew. While sewing I find a piece is wrong. Go to change it. Print. Why is it taking so long to print? Oh, it went to Acrobat. 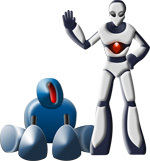 There's some update I have to get to make the Acrobat printer like vista 64. For now, it crashes. Illustrator won't come back. Great. Apparently I didn't save last night. Even better. At least I have the rest all printed out. Sew. Oops, I put the middle piece on wrong. His elbow will go backwards now. Finish sewing. Oops, I put the forearm on wrong. His elbow will twist funny. Yeah, not a good day for me apparently. Still, I can tell where I need to change the pattern from this. So now I'll scan in my printed pieces, trace 'em, tweak, and make anothe sample. Is his arm a female, now? Who knows. Anyways, I've got the new arm. Tweaked it a bit since the last sample, but it should be ok. I had made my sample with an elbow angle right between the ones that I wanted to use. So, I then adjusted the pieces that handle the elbow joint to bend more or less. I then very carefully figure out which arm was which and flipped the other one. If you're curious, his right arm will be at more of an angle, because it will be holding his staff. This will be a load-bearing staff, since there's no way I'm balancing him on his two tiny feet. Even if I could, anyone could walk by and tip him over. I had been originally planning on giving him a tail of rebar and having him lean on that, but looking at his stance he seems to be leaning forward, so the staff makes more sense. At some point he aquired a tail, too. It's not in the picture. The first attempt there looked a lot more demented in real life. His bottom jaw is huge and his top jaw is teeeeny. I fixed that for the second one. There's been a few tweaks to the pattern since then, but they don't need another sample. Just made the top lips longer (they look long enough there but there is a half cm seam allowance) and reduced some of the pointiness in the eye area. There's a lot of detail missing in the head. He's missing three ears, four horns, the entire inside of his mouth, his nose, his eyelids, and of course his eyes. Whiskers too. There's a lot of *stuff* that goes on the head, and this is just the base that it all attaches to. Once I get the sizes, which is the next step now that I have all the patterns, I'll start working on the inside of the mouth and his many spikes/horns, which will all be done in paper mache. Last night I made 14 cones for his shoulder spikes, and just now at lunch I managed all eight fingernails and two of the toenails. So that's... 6 toenails, 2 thumbs, 2 dewclaws, 5 tail spikes, 2 big horns and 2 little horns left to make cones for. Then I'll have to bend the cones. I'll likely post a picture when I have them all. I could just paint them all green, and have a little low-polygon forest. Maybe some tiny Charr would move in. How do you know when Charr have moved into your forest, though? When your smoke alarm goes off because they BURNED IT ALL DOWN! Help I have cone-induced madness. 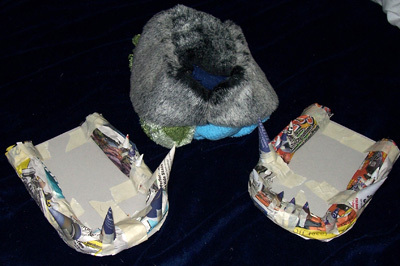 First, I made the forms for the jaws. They have teeth on. You know what teeth are? 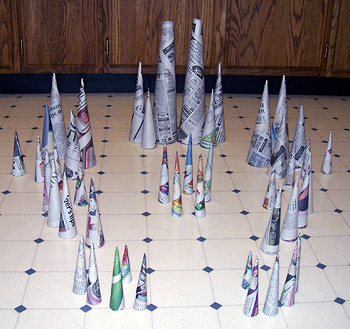 CONES. Anyways, got those done, think they turned out well. Next I went to the task of bending all of the other cones I had made. The spikes all have bends in them so mine have to too. The easiest way I've found to do this is to cut it at an angle half the angle you want it to bend, flip the tip around and tape it back on. Remember to tape the seam where you're cutting so it doesn't all unravel on you. There were an awful lot of them but I finally got them all done. Then, I figured I could do a first coat of paper mache on them all. So I go to make paste. I found a recipe online that said 5 parts water to 1 part flour and boil it for 3 mins. This seemed nice and economical on the flour. The recipe was unclear on when the water should be boiling and when you should put the flour in, so I figured I'd boil it seperately and then add the flour. Then I had the genious idea of reserving some of the water to mix with the flour so it would be easier to get the lumps out. Individually these things make sense. Together, they are a recipe for... DUMPLINGS! Honest. You can totally make dumplings that way. I wanted paste, though, not dumplings. So my second try I put the flour in first and that worked well. Didn't get much sleep last night though, and it hit 12:30 and I still had things that needed doing, so I didn't manage a first coat on everything. Got everything but the shoulder spikes and fingernails, though. The important thing with the first coat is to make a better structure, a lot of my tape jobs were very loose. Last night I snuck this into the picture but didn't mention it because it was just fabric pinned together. Now it is sewn. 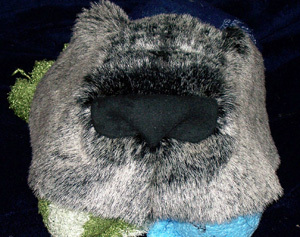 I made the nose by attaching fabric to a piece of a sticky backed fun foam sheet, bending it until I got nostrils I liked, and sewing them in place. Without the foam the fabric just went flat and looked like I sewed it wrong or something. I also finished doing the first coat on the paper mache stuff. Apparently it is humid here (and it was cold too) because the previous ones were still a little damp in places.